Besides leaving a large hole in the heart of every woman between the ages 50 and 60, the death of Davy Jones brings to mind one of the most unique stories in the annals of show business. Although the phenomenon known as the Monkees only last a few years in terms of hit records, television ratings and Tiger Beat magazine covers, their impact and legacy has remained intact to this day. Elements of the Monkees’ TV show can still be found in MTV music videos, and the blurring of reality and fiction used by the program was repeated with great success during the eight year run of “Seinfeld.” But the greatest achievement of Jones and company was becoming one of most successful rock and roll bands of their era, which was quite a feat considering that it happened at a time when groups like the Beatles, Rolling Stones and Beach Boys were all at the top of their game, and even more remarkable in that the Monkees were not even a real group…at first. Inspired by the Beatles’ first film, “A Hard Days Night,” filmmakers Bob Rafelson and Bert Schneider went to work developing a television show all about a rock and roll group. After selling the concept to Screen Gems, Rafelson and Schneider went about trying to cast the show. Originally, they considered using an existing group, the Lovin’ Spoonful, but the Spoonful was already with a record label, which would have prevented Screen Gems from marketing the music expected to be generated from the show. In September of 1965, entertainment trade papers began announcing open auditions to fill the roles of an aspiring rock band. Reportedly, England’s Davy Jones, a 20 year old actor/singer with Broadway experience was already on board. Eventually the producers settled on two musicians, Mike Nesmith and Peter Tork, and another actor, former child star Mickey Dolenz. Various songwriters were recruited to supply the group’s music, which would be featured throughout what would be a 30 minute sitcom. The “group” was named the Monkees, and made its NBC debut on September 12, 1966. The Monkees’ first record, “Last Train to Clarksville,” featured during the initial broadcast, became a monster hit, as did their first Colgems album, simply called “The Monkees.” Although not yet a functioning band, the four men did provide the vocals heard on all of their records. Quickly, the television show and its related music, were huge hits. Looking back, it’s easy to pick out the several components that made “The Monkees” a success. The four stars had distinct personalities, with Mike being the smart one, Peter the fool, Mickey the wiseass and Davy the cute one. The program’s comedy was fast paced, with a definitive zany Marx Brothers feel to it. Of course, the Monkees music was the most pleasant surprise. Some of pop music’s most talented songwriters contributed some of the era’s best songs, including Tommy Boyce and Bobby Hart (“Last Train to Clarksville”), Carole King (“Pleasant Valley Sunday”), Neil Diamond (“I’m a Believer’) and the Kingston Trio’s John Stuart, who penned Davy Jones’s signature tune, “Daydream Believer.” Although Mickey Dolenz was brought in based on his acting, it was his singing voice, according to Mike Nesmith, that gave the Monkees a distinctive sound. Finally, the Monkees popularity coincided with the garage-band boom that was happening at that time. In the mid-sixties, most dances, sock-hops, and junior high or high school parties included live music provided by a local band. The premise of the Monkees’ television show was that it was a comical look at a struggling rock group, which many young people could relate to. If you were a girl, you wanted to marry a Monkee, but if you were guy, perhaps you could be a Monkee. The amazing part of the Monkees’ story is the fact that, through necessity, they actually became a real band. Once their records began flying off the shelves, the idea of putting together a concert tour was inevitable. And so in December of 1966, after only knowing each other for a few months, and with Nesmith and Tork being the only two real musicians, the four Monkees made their live debut in Hawaii, performing reasonable versions of their hit records. However, Monkeemania did have its detractors, as critics were quick to point out that the Monkees did not play any instruments on their best selling albums, and, prior to their multi-city concert tour, were not a functioning band. Mickey Dolenz was particularly singled out, as his lack of formal training, and subsequent subpar drumming made him an easy target. Like most teenybopper fads, Monkeemania started to fade after about 18 months, and NBC canceled the series in early 1968. Still under contract with Screen Gems, Dolenz, Jones, Nesmith and Tork continued touring and recording as the Monkees, but without the power of a primetime television show as a promotional tool, the records stopped selling and the concerts were often sparsely attended. In 1969, Peter Tork quit the group, and Michael Nesmith exited the following year. By 1971, the Monkees had officially broken up, but Saturday morning reruns and later MTV showings of the series kept the group in our consciousness. Starting as early as the mid-1970’s, Davy Jones began appearing as a nostalgia act. Over the last 25 years Jones participated in several full and partial Monkee reunions, as getting all four together for a tour was never easy, as the Monkees, almost predictably, developed love/hate relationships among each other. Apparently, the Monkees weren’t too busy singing, to put one another down. 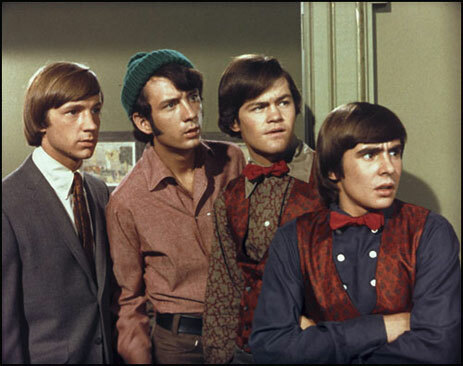 Of course, the death of Davy Jones at age 66 now makes any future Monkee reunions impossible…I suddenly feel a bit old. Notes: Originally, Davy Jones was cast as the Monkees drummer, but his small stature made him hard to see behind a full set of drums. Jones was reassigned to his familiar upfront role as a singer/percussionist.